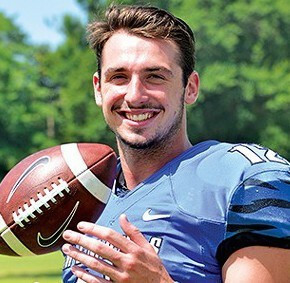 Top NFL prospect, Paxton Lynch was born February 12, 1994 and is a former quarterback for the Memphis Tigers and was their starting quarterback from 2013 to 2015. After redshirting his first year at Memphis in 2012, Lynch was named the Tigers' starting quarterback prior to the 2013 season. He started all 12 games, completing 203 of 349 passes for 2,056 yards, nine touchdowns and 10 interceptions. As a sophomore in 2014, Lynch started all 13 games. He completed 259 of 413 attempts for 3,031 yards, 22 touchdowns and nine interceptions. He also rushed for 321 yards and 13 touchdowns. Lynch was named the MVP of the 2014 Miami Beach Bowl after passing for 306 yards with four passing touchdowns and three rushing touchdowns. As a junior in 2015, Lynch again started all 13 games. He completed 296 of 443 passes for 3,778 yards, 28 touchdowns and four interceptions. In Memphis' 630 victory over SMU, Lynch tied an FBS record with seven passing touchdowns in a half. He finished 9 of 14 for 222 yards, and completed his touchdown throws to seven different receivers. After the season he entered the 2016 NFL Draft. Football stars such as a Paxton Lynch have taken the game to new heights by excelling at their respective position. The booking agents at AthletePromotions can assist with Paxton Lynch speaking engagements or appearances from NFL stars. We have years of experience in booking gridiron greats for keynote speeches and autograph signings. Hiring a football speaker like Paxton Lynch is not a hard process. Our agents can provide availability, fees and all costs associated in bringing out a successful football star to your next corporate event. We can find Paxton Lynchs agent to make this booking happen. A Paxton Lynch appearance will add energy to your upcoming event and reward employees, customers and clients.Most likely, football fans and corporations can find Paxton Lynch's official website, charity involvement, Twitter account, representation, publicist and management info at www.Paxton Lynch.com.